Creamy Orange Ginger Chicken - Low-Carb, So Simple! | Low-Carb, So Simple! My husband likes chicken. One of his favorite dishes is chicken curry with vegetables. I’ve made it so many times that this time I wanted to try something different. Something juicy with a subtle bite. 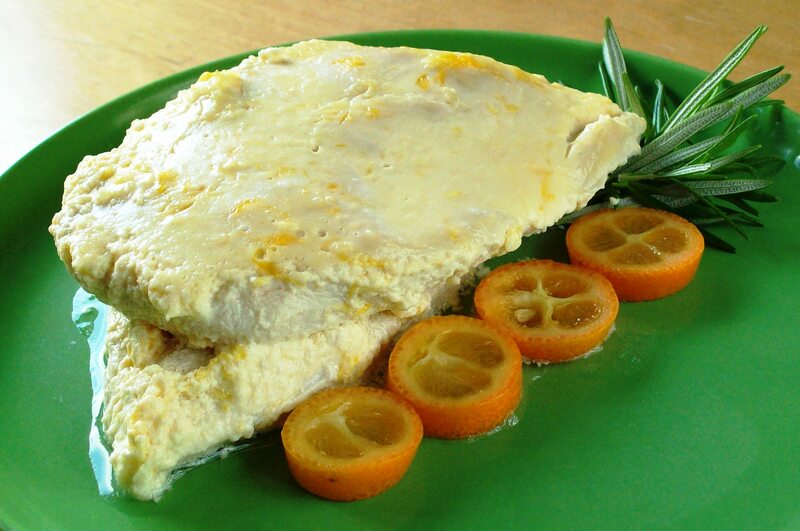 When thinking of juicy, orange with its gentle fruitiness goes perfectly with chicken. A piquant touch of ginger gives the bite. I wanted to tie the flavors with something creamy, and sour cream seemed to work well giving its freshly sour note. My husband loved the dish and encouraged me to publish the recipe. Hope you like this as well! Put all the ingredients in a plastic bag. Close the bag and mix well. Leave the bag in a cool place to marinate few hours or preferably overnight. When ready to bake, preheat the oven 400 °F (200 °C). Lay the chicken and the marinade in a glass or ceramic baking dish and bake some 40 minutes or until the juices run clear. I don’t know why I immediately thought of orange when I was thinking of a chicken dish. I guess because fruit goes well with chicken. In my first experiment I tried orange flavor to keep the carb count really low. That was okay, but a bit too artificial to my taste. I have a cookbook called North African Cooking which includes recipes for Moroccan main courses with orange blossom water. I got the idea to use orange blossom water in this dish. One teaspoon didn’t taste at all, one tablespoon a bit too much. I have to admit that the flavor was really interesting. Either you love it or hate it. Something between one teaspoon and one tablespoon could have been ideal. However, I didn’t try with orange blossom water anymore but chose another path and gave a try to real orange juice. That gave unquestionably the best flavor. The carb count of a portion is still surprisingly low even with real orange juice. You can sauté the chicken also in a skillet instead of baking it in the oven. I would like to use grass-fed chicken more often but it’s not that easy to find. Grass-fed is much healthier than meat produced by intensive farming. Do you like to eat grass-fed meat, if yes, do you find it easily? I love both ginger and orange so I bet I would love this! It used to be one of my family’s favorite dishes. I should make it again after a long time!